SpaceFest 9 is next week! I’ll be there July 5 – 8 with lots of other scientists, astronauts, and space artists. And hey! The season 2 premier of “Salvation” is tonight! I’m the tech consultant for the show, and this season I’ve been very, very busy with it. If you watch it and the ratings are good we’ll get a season 3 and then I’ll be able to continue to do things I like such as eat and support my family and pay my internet bill so I can complain about things and post pictures of my animals. Win-win. Monday, June 18, 2018: Erosion... on the Moon? Coooool. You can see the craters and equatorial ridge more clearly, and even some boulders and mounds on the surface! The big mount near the bottom left is about 30 meters across, I think, about half again as big as a tennis court. So yeah, we’re starting to see details. The horns at the top left are likely due to lighting around a crater rim or some other terrain. The bright spot is interesting. It’s persistent in many images, and I’m not sure if it’s just due to the angle of the surface reflection sunlight better, an albedo feature (literally brighter material), or a combo of both. 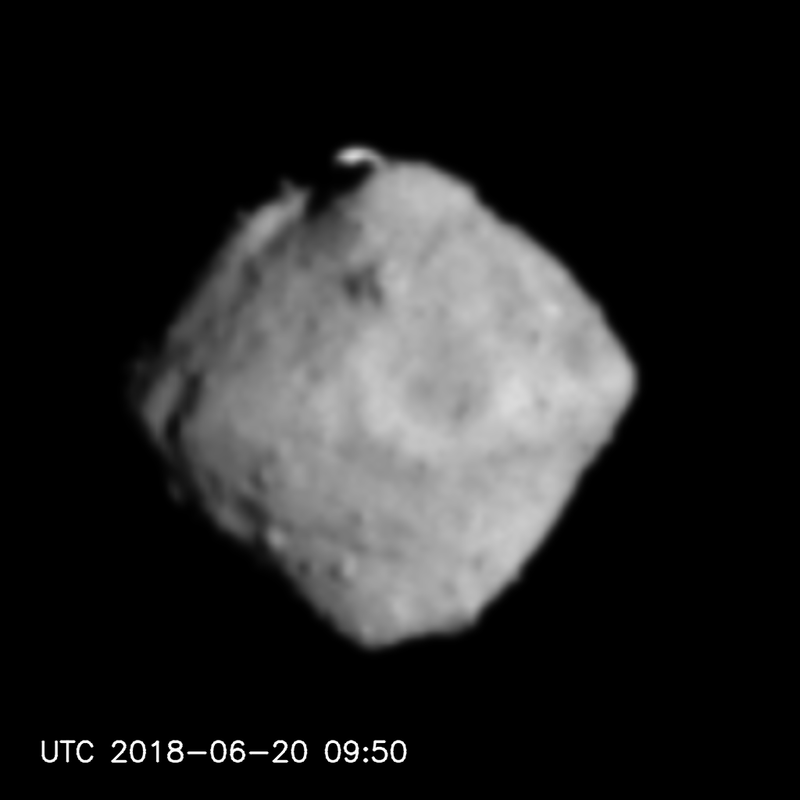 I suppose we’ll know in a few weeks as Hayabusa gets even closer. I expect that most of you reading this probably already follow my friend Katie Mack on Twitter, but for those of you don’t, now’s your chance to correct that oversight. Katie’s a brilliant cosmologist, and a good person. She frequently writes about astronomy and social issues, and I find myself agreeing with her pretty much all the time. She also brooks no babbling; when she posted about global warming an arrogant climate science denier decided he should step in, and her response smacking him down was both sublime and brutal. I dunno, man, I already went and got a PhD in astrophysics. Seems like more than that would be overkill at this point. Katie was interviewed by another friend (and previous Follow ‘o the Letter subject) Alie Ward for her podcast “Ologies” and was so cool Alie had to split it into two episodes to squeeze in all the coolness. So go ahead, follow her. You’ll be a better person for doing so. I love rock, especially Queen — I’m a human being, after all — and I love orchestral classical music. I was raised with the latter, and have played in an orchestra or two in my time (bass trombone, if you must know). When the two genres are mixed, it can be magical. Evanescence’s first album is completely overwrought and goth and amazing and I love it, too. So if you take Queen, orchestral classical, and add them to a Marvel MCU edited clip reel, what do you get? The music is Queen + Helmut VonLichten, a mashup VonLichten did with Brian May, guitarist for Queen (and, I’ll note, an astronomy PhD holder for his work on zodiacal light). Here’s the whole piece. You wouldn’t think you could improve on “We Will Rock You”, but here we are. It’s incredible. “Waving your Banner all over the place”. Brilliant.